CUT OFF FOR T-SHIRTS IS JULY 12TH! 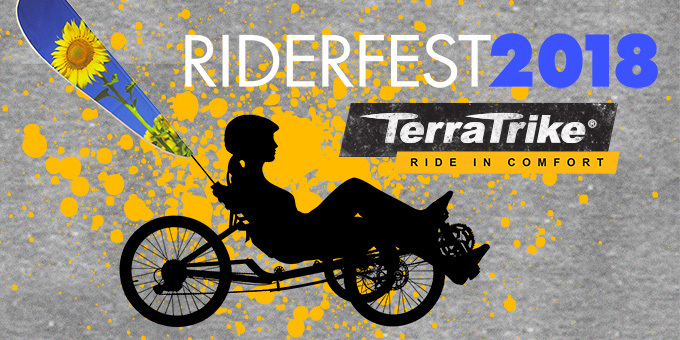 Join us for the 5th Annual TerraTrike RiderFest! This year’s event takes place on Saturday, July 28, 2018, from 8am to 3pm. RiderFest is a day filled with trike riding, fun, food and friendship… and a few surprises! Don’t miss this awesome event! The ride staging area will be Johnson Park in SouthWest Grand Rapids. Johnson Park offers extensive parking, restrooms, and connects to the paved network of Kent Trails.Registration begins at 8am, Photo at 9am, and then we’ll head out for a morning trail ride. The RiderFest 2018 trail ride will be a 10 mile out and back route. The route is mainly an easy flat paved path that follows along the Grand River. RiderFest 2018 will be a casual ‘no one left behind’ ride, and will include TerraTrike staff riding along, as well as SAG support. The ride is open to all types and models of trikes and bikes, not just TerraTrikes. Helmets are required for all riders, and a liability waiver must be signed at time of registration. After the ride, the day will continue with lunch, games and contests at the Johnson Park staging area. At noon, a catered lunch will be provided at Johnson Park. Lawn games, activities, and award presentations are planned. RiderFest is a great time to network with other trike riders, as well as the staff of TerraTrike. Also, back by popular demand, Chonk’s Challenge – a grueling 1.5 mile hill climb that will begin shortly after lunch with a special prize for all who complete it. We also encourage riders to wear their best riding costumes. This years prize for best dressed will be something special. We will also be showing all of our NEW products as well, including a few not yet released ones! There will be a nominal fee ($10.00) per person to help offset the cost of shirts, food and activities. The last couple of RiderFest events have been great fun, and we hope to see everyone again in 2018! Please note: There will be minimum items for sale. Please bring any accessories with you. Our local dealer, West Michigan Bike & Fitness will be on site with limited accessories for sale and their store is only a few miles away should you need any last minute supplies. Any person participating in an activity or event organized by or related to WizWheelz, Inc. or who has a minor child who participates in such an event or activity, individually and/or on behalf of his or her minor child, as the case may be, releases, forever discharges, holds harmless and agrees to indemnify WizWheelz, Inc. and JDW Real Estate, LLC together with the members, employees, agents, insurers, and/or other representatives from all actual and potential claims, complaints, demands, causes of action, damages, costs, expenses, fees, and other liabilities of every sort and description, and including but not limited to, attorney fees, costs, and expenses (collectively, the “claims”), arising out of, caused by, or otherwise related in any way to the participation by said person and/or his or her child in any activity organized by or related to WizWheelz, Inc. or on any property owned by JDW Real Estate, LLC. RiderFest 2018 will begin at 8:00am, and will consist of a 10 mile paved trail ride. Ride it twice if you want a longer ride. From Johnson Park, the route heads south, crossing the Grand River at Wilson/28th St. and then continues along the south side of the Grand River. The ride is a loop (long) or out and back (short) and all riders are welcome to ride as far as they want to with plenty of opportunities to turn around if needed. Overall, the ride route is mainly an easy flat paved trail. The Johnson Park staging area has ample parking and restrooms. SAG support will be available. Helmets are required for all riders and a liability waiver must be signed. 1-3:00 – Games, presentations and trike test riding! 3:00 – Event ends – Go Home!